Every single month, there is one special evening that I keep free. No dates, no dinners out and no distractions. I have a very important reoccurring appointment—I have a date with the full moon. The full moon holds a lot of power and wisdom. Just gazing up at it in the sky, I am filled with a sense of wonder and the feeling that anything is possible. The moon helps me connect to a deeper source—an all-knowing, higher version of myself. The part of myself, that I sometimes ignore, as logic takes over. But every month, the moon draws me in and invites to pause and to dream. Over the years, I have developed a ritual, a way of tapping into the moon’s energy and bringing that sense of infinite possibility back into my life. 1. 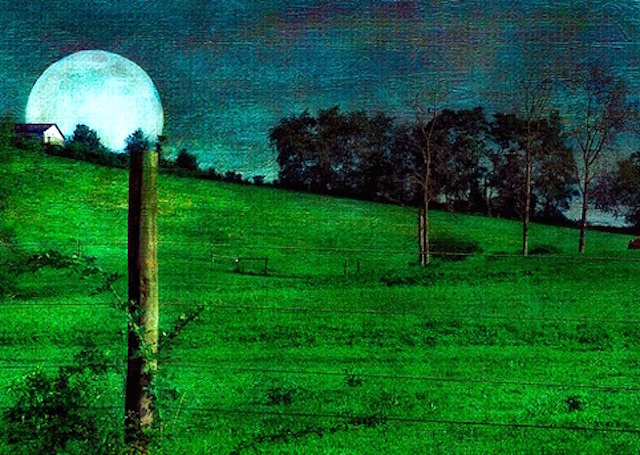 Find a quiet place outside where you can see the moon. If this is not possible, find a place indoors and open the windows if you can. 2. Roll out your yoga mat, sit down and bask in the moonlight for a few minutes. Still your mind, let your thoughts go and set your intention to connect to the moon’s energy. 3. Now spend a few moments dreaming of your best possible life. There are no limits here whatsoever—only your imagination can hold you back. Savor and taste your dream—involve all your senses in dreaming this amazing life of yours. With every inhale imagine that this dream is saturating every cell of your body. 4. Ask yourself what quality you need to cultivate or action you need to take in the coming month to make this dream a reality. Try not to think of an answer or force something to come into your mind. Just sit with the question and be open and receptive. 5. Once you have a knowing, open your eyes. Write it down on your piece of paper. 6. Pour the non-dairy milk into the glass and hold the glass in both hands. Re-establish your connection with the moon and ask her to imbue your drink with the quality or action you wish to cultivate. Visualize this happening. 7. Bring your hands together at your heart centre and bow your head down. Thank the moon for her power, her energy and her assistance in helping you live your best possible life. 8. Stand up, walk to the front of your mat and do a few rounds of Moon Salutations. See video below. 9. Place the glass directly under the moonlight (outside or on a window sill) with the piece of paper under your glass. 10. Drink your moon infused nectar first thing when you wake up in the morning and get set for a magical month ahead! I practice this ritual even if there is cloud cover and I can’t see the moon. In that case, I tune in even more to feel the moon’s energy and use my imagination to “see” the moon behind the clouds. This is a tutorial of the Moon Salutations I practice (Prana Flow style). How to Become a Successful Quitter. Relephant bonus: We are part of the Universe, but how much does that really affect us, day to day? Nice ritual but I thought full moon is for releasing that which no longer serves you and new moon for manifesting what you want to bring into your life? From the moment Rosalie e’Silva was born in a tiny little village in Namibia, her life has been one big adventure! She grew up all over the world, moving countries about once a year and hasn’t stopped searching for that place to call home. A television journalist, Rosalie has worked for CNN, NBC, France 24 and Al Jazeera. She is currently taking a break from the newsroom to indulge in her love of yoga. 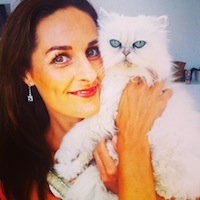 She is teaching Vinyasa Flow yoga in the Channel Islands where she lives with her vet husband and cat, Venus. She is a vegan, an animal lover and firm believer that life is whatever you make it. Connect with her via Instagram or her website.